Taking It to the Next Level - Trisoft Graphics Inc.
Flexographic printing quality has been approaching that of gravure for some time now. Although it has been attractive to printers due to its lower price point than gravure printing, one of flexo’s shortfalls has always been that its quality is not at the same level as gravure. 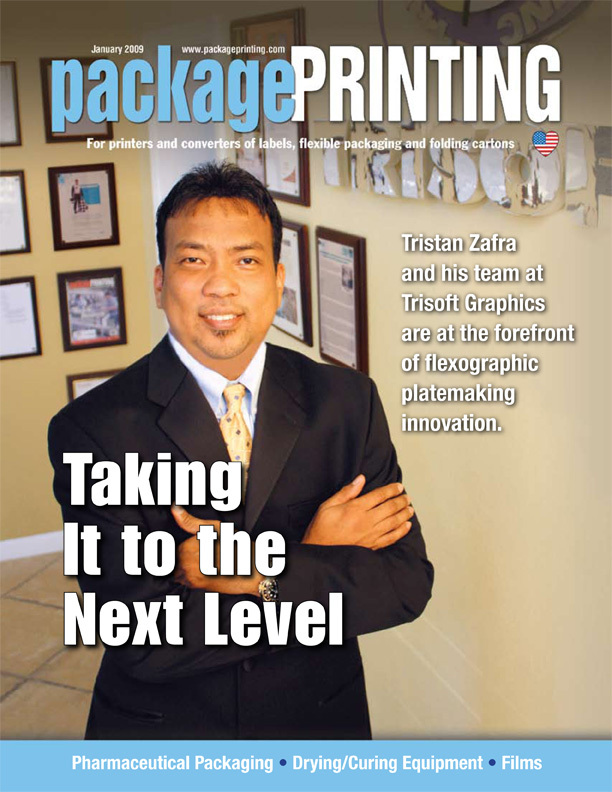 Trisoft Graphics, Inc. (www.trisoftco.com)—a digital prepress and graphic design company serving the packaging industry since 1993—recently installed a new flexographic platemaking system it expects to use to produce flexographic printing plates that, when employed, will rival gravure’s quality. It is to this end that Trisoft recently added a KODAK FLEXCEL NX Digital Flexographic System. The new system installed at Trisoft Graphics includes a KODAK TRENDSETTER NX Mid Imager and KODAK -FLEXCEL NX digital flexographic plates. The system joins the company’s existing KODAK THERMOFLEX narrow platesetter, and it plans to use both systems simultaneously. According to Zafra, Trisoft has led the charge on the West Coast, employing technology innovations at its 6,000-sq.-ft. facility. In 2003, the company was the first service provider in the region to implement a THERMOFLEX platesetter. In 2004, it was the first service provider on the Coast to implement thermal processing for its plate processor. Zafra contends that with the installation of the FLEXCEL NX System, it is again leading the way on the West Coast. Our customers are more or less shocked by the initial results in quality. They are very enthusiastic since they can finally compete with gravure printing at flexographic prices. “This system uses offset imaging technology, along with a revolutionary thermal imaging layer, to transfer the image from the digital file to the plate, and in doing so, produces a true representation of each pixel in the digital file,” says John Anderson, flexo plates product manager, Americas, Packaging Products, Kodak’s Graphic Communications Group (www.kodak.com). “This has allowed flexo printers to print with excellent repeatability and consistency at higher resolutions than traditional flexo, and achieve resolutions equal to that of offset or gravure class.” Another advantage to adding this system to its arsenal include increased resolution. All of the plates Trisoft produces are made with a quality-control strip and a pass/fail mark to help ensure stability and repeatability on press and during prepress. Every plate is then measured and finally inspected for any flaws before the plates go out to its customers. Zafra says, “KODAK TRENDSETTER NX Platesetter is a very stable platform, and combined with the Kodak -FLEXCEL NX plates, our customers get one-to-one results from the one-bit tiff to the plates.” He adds that there is no dot sharpening and the system does not need a bump curve to hold the highlight dots.